Squid has quickly become a staple ingredient for me in the last year. I've always loved eating it, but I was intimidated for years to cook with it. Besides, where I grew up, and in all the neighborhoods where I've lived in the past, I almost never saw it at a fish market. My current neighborhood, Astoria, is predominately Greek, and squid is everywhere. I never realized how simple it was to cook, nor how inexpensive it is (about $2.99 a pound to buy it already cleaned). Every fish market and fish counter in every grocery store has it. Nearly every restaurant within a three-mile radius serves grilled squid, charred quickly over open flames and doused with lemon juice and olive oil. At home, I first learned to steam small squids, cleaned and cut into rings and tentacles, which I then mixed with diced bell peppers, herbs, lemon zest, and a splash each of vinegar, lemon juice, and olive oil. It's a great salad warm or cold. 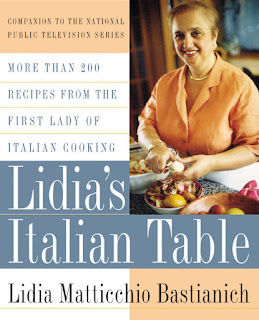 A few days ago while flipping through one of Lidia Bastianich's cook books (Lidia's Italian Table), I found a picture of baked squid and potatoes, all of it golden brown and speckled with a liberal amount of chopped parsley. The recipe was so simple, I didn't even follow it: I read it through once or twice and then adjusted to my own tastes and the fact that only two of us would be eating it for dinner. Because of how easy it was and how inexpensive all the ingredients were, I am looking forward to making this again the next time family comes over for a meal. 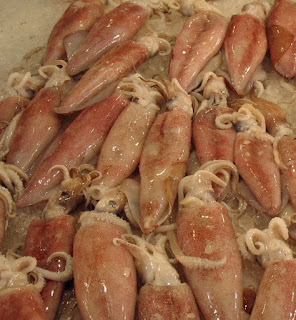 Cut the squid bodies into thick rings. Leave the tentacle pieces intact. In a large bowl and using your hands, tumble the squid pieces with the olive oil, parsley, and a bit of salt and pepper, until everything is well coated. Using your hands again, tumble in the potatoes and onion. Spread the mixture into a large ceramic baking dish, such as a lasagna pan, trying to maximize surface exposure. Pour the water into the pan, stopping short if it fills the dish more than a quarter of the way up the sides. Cover the pan tightly with foil and pierce the foil in a few places with a fork to let some of the steam escape. Bake for 30 minutes. Uncover and continue baking, stirring the squid and potatoes at least two or three times to encourage even browning. The total cooking time should be just about an hour. Let the dish cool a few minutes before serving, and be sure to stir up any remaining juices or gravy that has developed on the bottom on the pan. Serve with a drizzle of "salsa verde" (an extra virgin olive oil-based dressing that includes a lot of finely chopped parsley, capers, lemon zest, minced garlic, and salt).